Contact us for information about bulk orders. 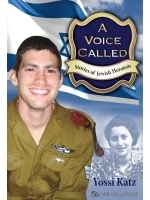 “A VOICE CALLED” - STORIES OF JEWISH HEROISM is a collection of articles about some of the great Jewish heroes of modern times. The book is a collage of role-models and inspiring makers of Jewish history. The first chapter tells the story of Theodor Herzl, father of modern Zionism, who died at the age of forty-four. He accomplished so much in just a few short years. His story is followed by an array of chapters about unique heroes and heroines including poets and song-writers, spies and underground fighters, soldiers and statesmen, boxers and a basketball player, a religious Christian, an astronaut and many others. The stories are written to shed light on Jewish history and to inspire the reader to live in the present with pride and dignity and to help build a better future. Some of the heroes are famous like Chaim Nachman Bialik, Sarah Aaronsohn, Rachel the Poetess, David Marcus and Menachem Begin. Other chapters deal with little known heroes like Michael Halpern, Manya Shochat and Zivia Lubetkin and then there are the unsung heroes like Michael Levin, Adam Bier, Alex Singer and Brian Bebchick. Readers will meet courageous fighters like Roi Klein and inspiring poets like Naomi Shemer. They will learn about the struggle after 1967 to free Soviet Jews from perspectives on both sides of the Iron Curtain. The book title takes its name from a poem by the great Hebrew poetess and fighting partisan Hannah Senesh who wrote, “A voice called and I went”. Hannah answered an inner calling when she moved to Israel in 1939 and again when she volunteered to parachute into Nazi occupied Europe to help rescue her Jewish people. She gave her life to light a fire that continues to burn brightly today. The legacy of these inspiring Jewish heroes is one that will remain with the reader for an eternity.